We Need Your Help In Helping Others! Some of you may know my hometown is Santa Rosa, California—my wife, kids, and I were all born in Santa Rosa, and all of our families still live there. 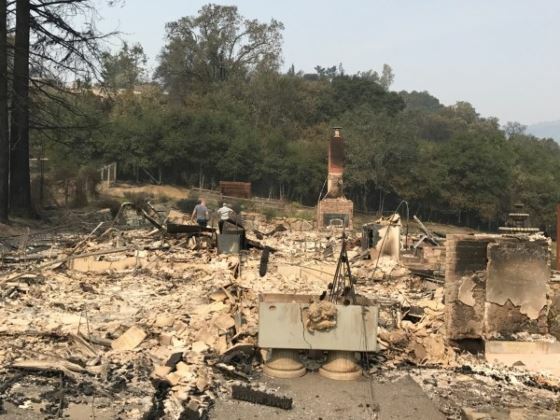 Recently that area was hit hard with a catastrophic wildfire that left at least 40 people dead, and thousands without a home. Fortunately our families are okay. However we know many people who had to leave their homes in the middle of the night some only to return to nothing but ashes where their houses once stood. We have been looking for a tangible way to help our hometown and some of our friends who have lost everything—the best way we know how to help is with our coffee shop. So this Saturday (Oct. 28th) we are going to have $1 off every 16oz latte sold—and we will donated 50% of our sales for that day to a relief fund for the fires. All money raised will be given to a family who are our dearest friends, who we have known for years—they lost everything to the wildfires. It was just recently some of the Meints family came to Central Oregon and stopped by Proust Coffee to visit us and support our new business. We can't imagine the heartache they are all experiencing. We deeply love this family and ask you to help us help them rebuild their lives. Miranda Meints and her family have lost their home and everything they own due to the wildfires in Santa Rosa California. They had to evacuate in the middle of the night and will need to rebuild their lives from the bottom up. During this whole ordeal they have been incredibly brave and truly thankful for the safety of their loved ones. Please consider donating or sharing their story, every little bit helps! So this Saturday (Oct. 28th) we are going to have $1 off every 16oz latte sold, and we will donated directly to them 50% of our sales for that day to help provide some relief in helping them rebuild their lives. My heart is hurting for my hometown and for our friends. Let's send them some love from Central Oregon and the Proust Coffee family. Newer PostCan Death Bring Hope?